Hill-start assist control helps to prevent the vehicle from rolling backwards when starting on incline or slippery slope. To engage hill-start assist control, further depress the brake pedal when the vehicle is stopped completely. A buzzer will sound once to indicate the system is activated. The slip indicator will also start flashing. • The shift lever is in a position other than “P”. • The accelerator pedal is not depressed. • While hill-start assist control is operating, the brakes remain automatically applied after the driver releases the brake pedal. The stop lights and the high mounted stoplight turn on. • Hill-start assist control operates for about 2 seconds after the brake pedal is released. • If the slip indicator does not flash and the buzzer does not sound when the brake pedal is further depressed, slightly reduce the pressure on the brake pedal (do not allow the vehicle to roll backward) and then firmly depress it again. If the system still does not operate, check that the operating conditions explained above have been met. • When hill-start assist control is activated, the buzzer will sound once. • In the following situations, hill-start assist control will be canceled and the buzzer will sound twice. • No attempt is made to drive the vehicle within approximately 2 seconds of releasing the brake pedal. • The shift lever is moved to “P”. • The parking brake is applied. • The brake pedal is depressed again. • Do not overly rely on hill-start assist control. Hill-start assist control may not operate effectively on extremely steep inclines or roads covered in ice. • Unlike the parking brake, hill-start assist control is not intended to hold the vehicle stationary for an extended period of time. 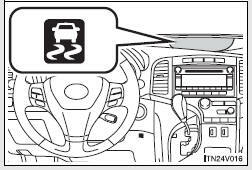 Do not attempt to use hill-start assist control to hold the vehicle on an incline for an extended period of time, as doing so may lead to an accident.